The masseter is a dense quadrangular muscle enveloping the lateral surface of the ramus of the mandible together with its coronoid process. The masseter muscle is a powerful muscle of mastication that raises the mandible. It is located over the lateral side of the ramus of the mandible. Superficial layer is biggest among the three layers of masseter and arises via a thick aponeurosis through maxillary process of zygomatic bone along with anterior two-third of the inferior margin of the zygomatic arch. Middle layer arises via lower border of the posterior one-third of the zygomatic arch. Deep layer arises via deep surface of the zygomatic arch. Superficial fibres, in order to be attached within the angle and lower posterior half of the lateral surface of the ramus of the mandible, travel inferior and posterior at 45°. Middle fibres travel perpendicularly inferior in order to insert within the central portion of the ramus. Deep fibres travel perpendicularly inferior in order to insert within the upper portion of the mandibular ramus as well as its coronoid process. 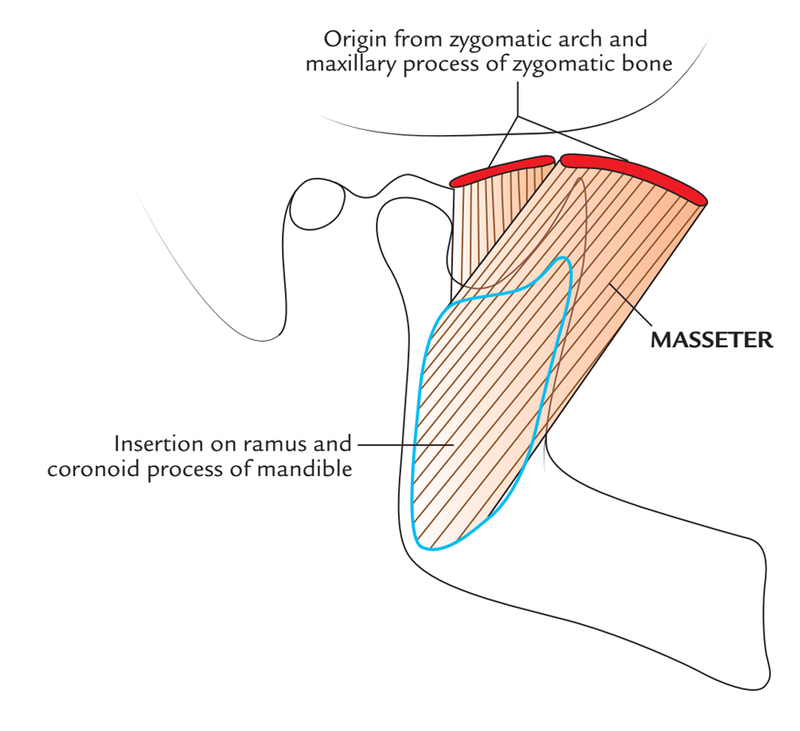 The masseter muscle is quadrangular in shape and is attached superior towards the zygomatic arch and inferior towards most of the lateral surface of mandibular ramus. The masseter muscle is mostly covered via the parotid gland, which is cupped nearby the posterior margin of the mandibular ramus and protrusive anteriorly superior to the masseter muscle. Intramuscular tendinous septa in the superficial layer create rims on the ramus of the mandible. 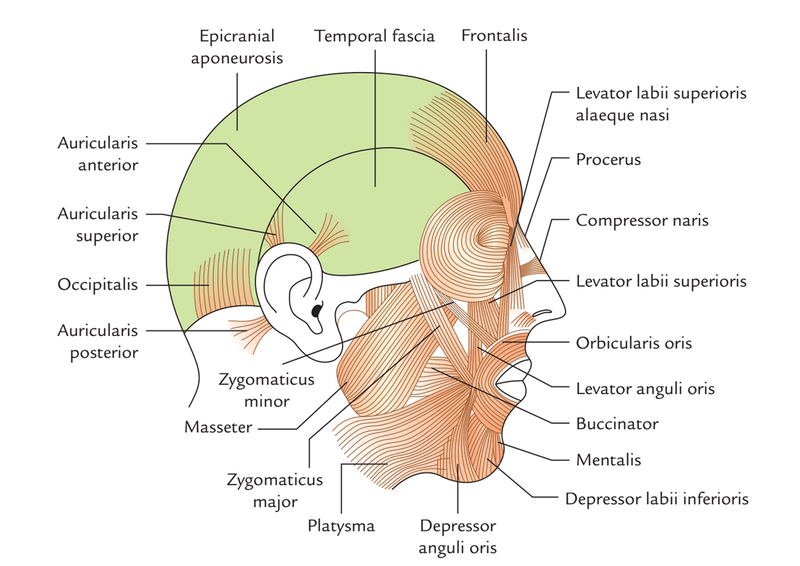 Facial part of the facial artery arises at the anteroinferior angle of the masseter where the facial artery coils near the lower margin of the body of the mandible. Transverse facial artery which is a branch of superficial temporal artery travels forwards through the masseter inferior towards the zygomatic arch. Parotid region is surrounded anteriorly via anterior border of masseter muscle. The masseter is located superior towards the ramus of the mandible. The deep fascia is not found facial region with the exception of over the parotid gland and masseter muscle, which are enclosed through parotidomasseteric fascia. The absence of deep fascia is vital in the face for the facial expression. Facial artery goes inside the face via coiling nearby the lower margin of the mandible by penetrating the covering the layer of deep cervical fascia on the anteroinferior angle of the masseter. Ramus of the mandible is enclosed laterally via masseter and medially via the medial pterygoid. The superficial lamina merges with the epimysium of masseter in order to create a thick parotidomasseteric fascia, which is attached superior towards the zygomatic arch. After developing from the gland, the parotid duct travels forward superior to the masseter in the middle of the upper as well as lower buccal divisions of the facial nerve. By traveling via the mandibular notch of the ramus, the neurovascular bundle innervating the masseter muscle inserts in the deep surface of the muscle. The masseter is innervated through a masseteric nerve, which is a part of anterior division of the mandibular nerve. The masseter muscle is a main elevating muscle of the mandible. Since the fibers of the superficial head are also slanting posteriorly, they help in projection of the mandible. The deep head of the masseter is more vertically oriented and also has a minor role in protrusion of the mandible. Even though the muscles of mastication are paired, they all attach on the mandible and so all actions of the mandible involve synchronization of masticatory muscles. The masseter muscle raises the mandible in order to close up the mouth. The muscles of mastication and their motor innervation are examined clinically via closing the teeth constantly and then examining the temporalis and masseter correspondingly within the temporal fossa and above mandibular ramus.